Go to original pattern for design DROPS 192-44. 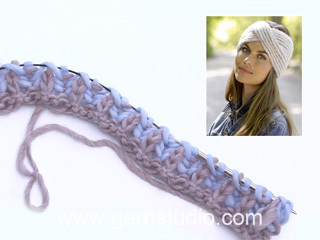 Knitted head band in DROPS Air. 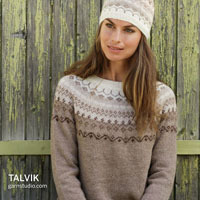 Piece is knitted in English rib in two colours and cable mid front. 13 stitches in width and 18 rows vertically with English rib (seen from right side, i.e. 36 rows in total) = 10 x 10 cm. DROPS CIRCULAR NEEDLE SIZE 6 mm, length 40 and 60 or 80 cm. DROPS CABLE NEEDLE - for cable. ROW 1 (= wrong side): Knitted with fog. Work 1 stitch in garter stitch, * 1 yarn over, slip 1 stitch purlwise, knit 1 *, work from *-* until 2 stitches remain, 1 yarn over, slip 1 stitch purlwise and work 1 stitch in garter stitch. Turn piece. 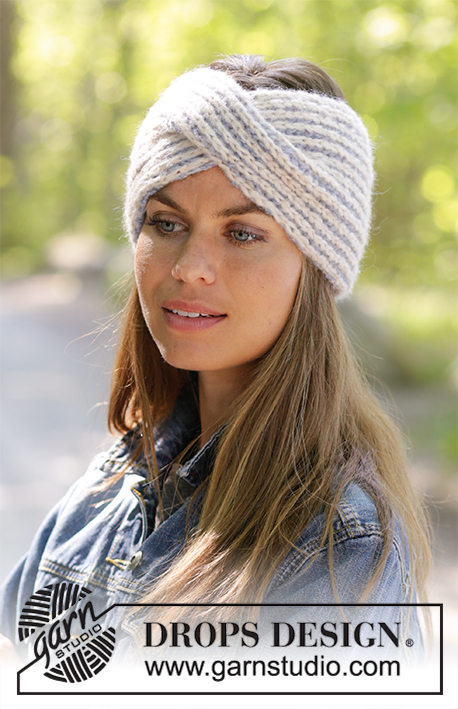 ROW 2 (= right side): Knitted with wheat. Slip 1st stitch with fog purlwise: * Knit yarn over and slipped stitch together, 1 yarn over, slip 1 stitch purlwise *, repeat from *-* until 2 stitches remain, knit yarn over and slipped stitch together, slip last stitch purlwise. Push stitches to the other side of circular needle and work from the same side one more time. ROW 3 (= right side): Knitted with fog. Work 1 stitch in garter stitch, * 1 yarn over, slip 1 stitch purlwise, purl yarn over and slipped stitch together *, work from *-* until 2 stitches remain, 1 yarn over, slip 1 stitch purlwise and work 1 stitch in garter stitch. Turn piece. ROW 4 (= wrong side): Knitted with wheat. Slip 1st stitch purlwise: * Purl yarn over and slipped stitch together, 1 yarn over, slip 1 stitch purlwise *, repeat from *-* until 2 stitches remain, purl yarn over and slipped stitch together, slip last stitch purlwise. 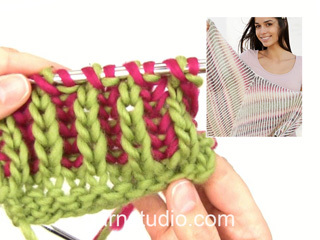 Push stitches to the other side of circular needle and work from the same side one more time. ROW 5 (= wrong side): Knitted with fog. Work 1 stitch in garter stitch, * 1 yarn over, slip 1 stitch purlwise, knit yarn over and slipped stitch together *, work from *-* until 2 stitches remain, 1 yarn over, slip 1 stitch purlwise and work 1 stitch in garter stitch. Turn piece. Work piece back and forth on circular needle. Cast on 40 stitches on circular needle size 6 mm with wheat. Work as follows from right side: Work 1 stitch in GARTER STITCH – read explanation above, * knit 2 stitches together, purl 1 *, work from *-* until 3 stitches remain, knit 2 stitches together and finish with 1 stitch in garter stitch = 27 stitches. Cut the yarn. Then work ENGLISH RIB WITH 2 COLOURS - read explanation above. REMEMBER THE KNITTING TENSION! When piece measures 24 cm, adjust so that next row is worked with fog from right side, slip the first 13 stitches on cable needle behind piece (yarn overs are not counted as stitches), purl next stitch (= knit 1) together with next purl stitch and yarn over (= 1 stitch decreased), work 12 stitches in English rib, cast on 1 stitch with wheat, knit English rib over all 12 stitches on cable needle (1st stitch is purled, and has no yarn over) and finish by knitting yarn over and knit stitch together = 27 stitches. Cut the yarn (in wheat) and continue with English rib (stitch that was cast on is purled, and hos no yarn over) and stitches in garter stitch as before until piece measures 49 cm. 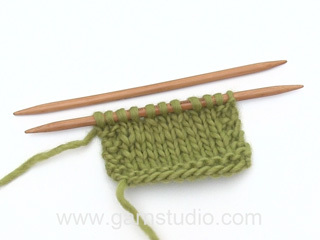 Cast off with wheat with knit over knit and purl over purl. 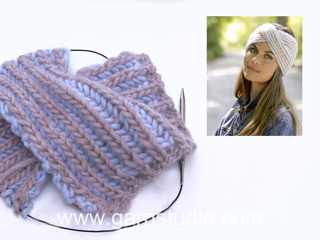 Sew cast-on edge together with cast-off edge in outer loops of edge stitches. 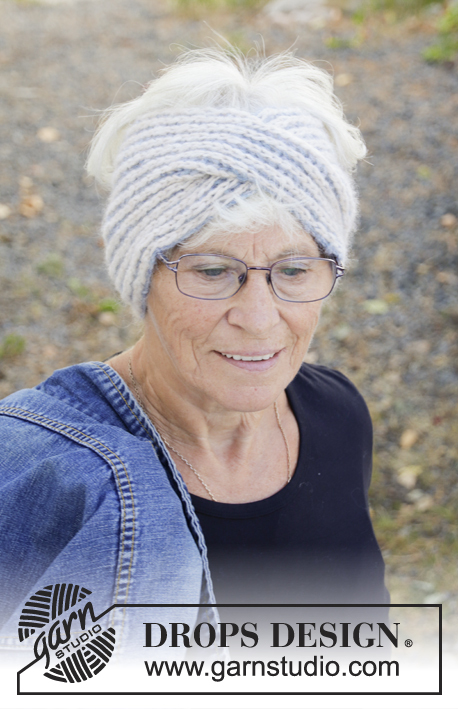 Correction:When piece measures 24 cm, adjust so that next row is worked with fog from right side, slip the first 13 stitches on cable needle behind piece (yarn overs are not counted as stitches), purl next stitch (= knit 1) together with next purl stitch and yarn over (= 1 stitch decreased), work 12 stitches in English rib, cast on 1 stitch with wheat, knit English rib over all 12 stitches on cable needle (1st stitch is purled, and has no yarn over) and finish by knitting yarn over and knit stitch together = 27 stitches.